A CAVE DIVER who lives in Ennis, Co Clare flew out to Thailand on Friday and was part of the rescue mission that saved the 12 boys and coach trapped in a cave. 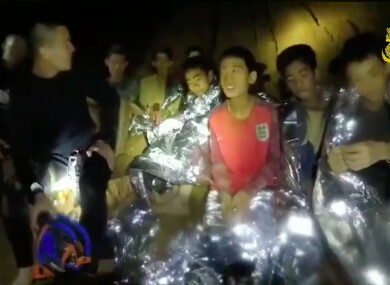 After 18 days trapped in the flooded Thai cave, the 12 boys and their football coach are now freed following an astonishing rescue mission. Jim Warny, an active cave diver and member of the Irish Cave Rescue Organisation (ICRO), was part of that mission. Brían MacCoitir of the ICRO told TheJournal.ie that Warny flew from Shannon on Friday. MacCoitir said that Warny called back home today to say everything worked out. “He did say it was very difficult, very challenging and it has been full on between travelling out and diving. We can now breathe a sigh of relief that the rescue was successful and also that our colleague is safe and well. The Belgian Ambassador to Ireland Pierre-Emmanuel De Bauw sent a tweet congratulating Warny who is a Belgian national and resident of Ennis, Co Clare. He said Warny played “a decisive role in saving the lives of the 12 boys and their coach in Thailand”. MacCoitir explained that Thai authorities had requested cave divers from the British Cave Rescue Council (BCRC). “The British Cave Rescue Council is an umbrella body for cave rescue teams like ourselves. We are affiliated even though we are independent. Warney was contacted because he’s part of a cave diving group with the BCRC. It has a number of specialist groups including cave search and rescue, cave diving groups, etc. MacCoitir said Warny’s role is now finished so he’s expected to return home in the next couple of days, adding, “It’s great, the fact that everything has worked out”. Meanwhile, an east Limerick village has been commended for the role it played in the Thai rescue. Specialist diving equipment from Cappamore, Co Limerick was rushed to Thailand last week after local man, Cathal Mullane, responded to an emergency worldwide appeal for the kit. Fine Gael Minister Patrick O’Donovan said it proved crucial in the rescue of the boys and their coach who had been trapped underground for more than two weeks. Email “Cave diver from Clare flew out to be part of Thai rescue mission that saved 12 boys and their coach”. Feedback on “Cave diver from Clare flew out to be part of Thai rescue mission that saved 12 boys and their coach”.